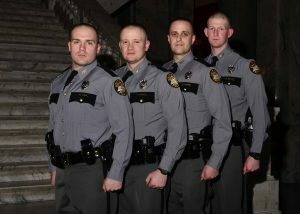 Ashland, Kentucky – (February 11, 2019) The Kentucky State Police in Ashland welcome four new Troopers to their ranks: Trooper Jansen Hacker, Trooper Patrick Bailey, Trooper Steven Davidson, and Trooper James Rowland (as pictured, from left to right). All were among thirty-five cadets to graduate the twenty-five week training academy in Frankfort on Friday, February 1, 2019. With the addition of these thirty-five new Troopers, there are now 809 Kentucky State Police Troopers working across the Commonwealth. Field training officers will supervise the new Troopers for twelve weeks before working their assigned area. Upon the completion of their field training, all four will be assigned to the Greenup County squad. 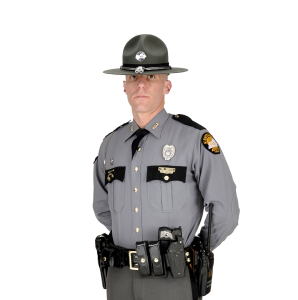 KSP is now continually accepting applications for cadet classes, with the next one tentatively scheduled to begin in May of 2019. For more information, visit the Kentucky State Police Recruitment website at http://kentuckystatepolice.org/recruitment/. Applicants may also call the Recruitment office toll-free at 1-866-360-3165 during office hours from 8 a.m. to 4:30 p.m. (ET) Monday through Friday or leave a message any other time.